Sandy Sutherland has been the main athletics journalist in the East of Scotland for many decades, (while Fraser Clyne in Aberdeen. has concentrated successfully on the North-East). I must have met Sandy in the early 1970s and certainly by my peak year of 1975, when I was running for Edinburgh Southern Harriers, his articles in ‘The Scotsman’ were essential reading for anyone interested in every branch of Athletics: Track, Field, Road and Country. Sandy’s journalism was carefully researched, clearly written, encouraging and thoughtful. He commented in considerable detail on good quality performances and a ‘name check’ was always appreciated. 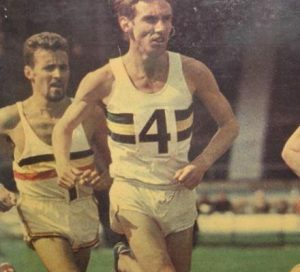 His enthusiasm, respect and good humour are evident in the first two paragraphs of his report on ESH demolishing the race record in the 1975 Edinburgh to Glasgow Road Relay. “The next time you look out of your window at the rain teeming down on a Saturday and think what a terrible day outdoor sportsmen are having, think again, for one – and perhaps slightly eccentric – sporting group appear to revel in the rain. 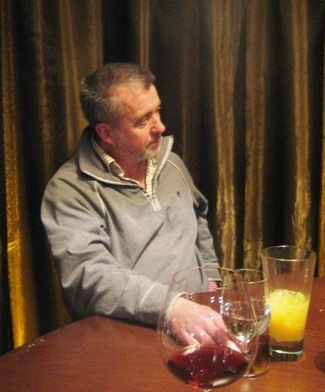 Sandy is a gentle, polite, talkative and cheerful man – not a towering, threatening ex-heavy events fellow! His fascination with the sport is impressively wide-ranging. 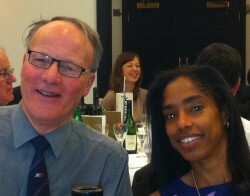 In the late 1970s, he and his wife Liz (an excellent athlete herself) formed the Scottish International Athletes Club. As athletics moved hesitantly towards professionalism, they thought that we needed a voice in important discussions, rather than leaving it all to officials in the Scottish Amateur Athletic Association. By 1980 the list of members was impressive, including most of the finest Scottish athletes. Olympian Don Macgregor was chairman, Liz Sutherland secretary, multi-eventer Stewart McCallum vice-chairman, and the committee included Adrian Weatherhead, Meg Ritchie and Allan Wells. 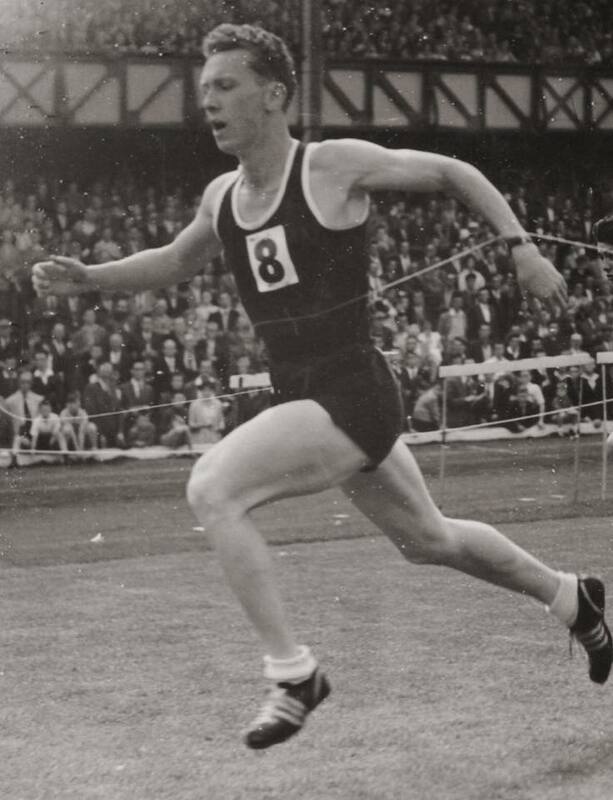 Others included Cameron Sharp, John Robson, Nat Muir, John Graham, Allister Hutton, Jim Brown, Jim Dingwall and several field event stars like Chris Black and Gus MacKenzie. This organisation may not have lasted too long but the fact that it was formed at all emphasises how much the energetic and dedicated Sandy cared for the wellbeing of his beloved athletics and the competitors themselves. 1958 was a year of intense memories for me at the Scottish Schoolboys Championships at Goldenacre in Edinburgh. Competing for Wishaw High School, I ran the U15 220 yards, beating the championship best performances in heat [24.3], semi-final [24.2] and final [24.0] on the grass, only to be beaten in the final stride by the great Roger Hallett of Bo’ness Academy in 23.8 in a new Championship Best Performance – he also set a CBP in the long jump – in what was considered the race of the day. But it wasn’t the performance of the day! I had been looking forward to seeing if my second cousin, William Cowan of Newmains J.S., could win the U15 Shot, since he had a 44 feet throw to his credit going into the championships, beyond the Schools’ record. When the Shot warm-up throws began, there appeared to be a dispute. The thrower from Golspie HS was claiming that the shot circle, in those days a grass circle painted out in lime, was in too close proximity to the running track. Having checked the distance from the circuit and compared it to the CBP, the officials dismissed the complaint. After a careful look around, the Golspie athlete lined up for his address, shifted across the circle with great speed, and promptly threw the shot high and long onto the middle lane of the grass track, a distance of 60 feet! We gasped! The athlete with the prodigious throw was one Sandy Sutherland, coached at Golspie by Alex Dalrymple, in whose honour a SSAA trophy for best thrower is awarded annually, and no wonder. Sandy was compact, broad shouldered and fast, and quite definitely the best technician on show, beating the CBP that day by a huge margin. Closer inspection afterwards found him in a tracksuit with a strange motif on the front, a huge wildcat, and the words ‘Touch not the cat but a glove’, a clan motto. With this throw and this accompanying narrative, he moved not only into the record books, but into a kind of legend. 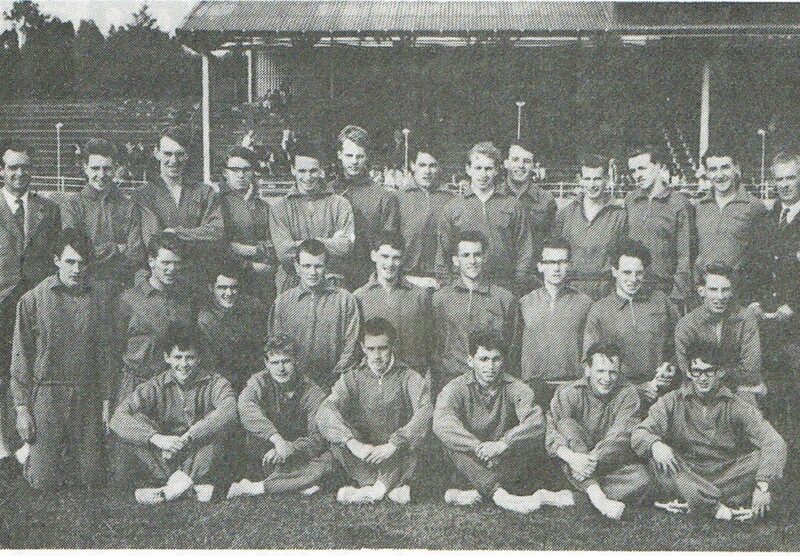 Three years later, 1961, he and I were both selected to represent Scottish Schoolboys at Maindy Stadium in Cardiff in the first full schools international, he in Shot & Discus, and I in the 200 yards hurdles, my new event. We all met up in Edinburgh at the Rosehall Hotel in Dalkeith Road the day before travel. Four of us shared a room, Sandy & I, and Roy McIntosh of Coatbridge H.S. [220 yards] and Norrie Foster of Uddingston G.S. [Pole Vault]. Cardiff was quite an experience for a first international, with the usual far too much standing around and walking to tire us out, hardly ideal preparation, but the visit to Epstein’s Majestas at Llandaff Cathedral was mainly worth it. We trained lightly on the track on that Friday afternoon until it was announced that there would be a trial for the 4 x 110 yards relay, surprising, in that we had two sprinters in the 100 & 220 yards. However, we dutifully went to our marks to win a place in the relay [I won the Ibrox Senior 100 yards a month later], and set off on the gun. The result for the first two was predictable, Roger Hallett [who won next day in 9.5, equalling the performance of the Olympic 100m bronze medallist and world 200m record holder at 20.5, Peter Radford, five minutes earlier in a demonstration race], and Hamish Robertson. I was third; Andy Leach, the other 200 yard hurdler was fourth, followed by Roy McIntosh, then Sandy Sutherland! More surprisingly, the trial stood for nothing, the four sprinters being eventually selected to run anyway! Surprised as I was that a thrower could sprint [yes, innocence on my part], I never forgot it, and have ever since appreciated the athleticism and speed of throwers, coaching my West Calder H.S. pupil, Commonwealth athlete and World & European Junior Alison Grey to British and Scottish titles in Shot, Discus, and, unsurprisingly by then, a SSAA 80m Hurdle win, in which she defeated the outstanding Catherine Murphy, the World Schools silver medallist. One of the abiding memories of Cardiff in 1961, apart from my 200H, Radford’s demonstration run, Roger Hallett’s astonishing response to it on the Maindy ash, and Epstein’s sculpture, was a simple incident in a Cardiff street. The four roommates, Sandy, Norrie, Roy and I were walking down a sloping street towards a busy intersection when we heard a woman scream from further up the hill. Hurtling towards us was a baby buggy with a child strapped in, heading for the main thoroughfare: the distraught mother had parked the buggy with the brake off outside a shop and had suddenly realised it was on the move; she had absolutely no chance of catching it – but we had. Lightning was our middle names as we sprint-started after it and retrieved it just before the deadly junction; the upset mother could hardly thank us for fright and shock, but, being teenagers, we just shrugged it off, muttering ‘You’re welcome’. Nevertheless, we got the shock of our lives as well, and it sticks indelibly in the memory. Yes, Sandy was as fast and agile as any sprinter, and was a regular Shot & Discus rep in Scottish teams in the sixties. Fifty years on, he was a sentimental prime mover in marking the fiftieth anniversary of our Cardiff international debut with a reunion lunch which he organised in Edinburgh’s Old Town in 2011. What memories! Hugh Barrow [Mile] was there, Cochrane Stewart [440yards] and Jim Craig, the Celtic Lisbon Lion [Long Jump] and as many others as could attend: the chat was non-stop. They were all delighted to hear that the 1961 match had been remembered in 2011, and that as a competitor in 1961, and as a SSAA team manager in 2011, I had been called out, and honoured, to present the hurdles medals. Sandy keeps in touch with that 1961 team, and is always passionate about locating, meeting and talking to the annual winner of the SSAA’s Bob Dalrymple Trophy. Sandy and I featured in Scottish internationals and in the great Edinburgh Southern Harriers team of the late sixties & early seventies when the club joined the British League and rocketed from Division IV to Division I in three seasons. His throwing team mates were Stuart Togher [HT], who became the U.S. Olympic Hammer Coach, his protégé, Chris Black, Olympic Hammer finalist, and Chris’ brother Alex [JT/ DT].Stuart’s brother, Justin Togher, sprinted with Dave Combe, David Farrer & John Derrick in a formidable 4 x 100m team: the 4 x 400m set a Scottish club record in Manchester and won 3 Scottish titles in a row, usually Sandy Robertson, Allan Murray, David Walker and Ray Gordon; Ray was national 400m champion, David the national long jump record holder, Allan the national 400H champion, I was a 400mH internationalist and Decathlon Club winner. 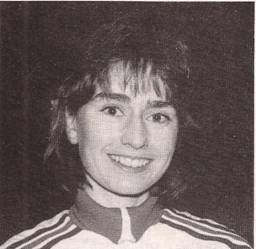 Apart from David, the jumps squad featured Duncan McKechnie, Scottish TJ champion, Alan Lorimer [Eric Liddell’s double in ‘Chariots of Fire’] and David Stevenson, Scottish PV record holder. On the track we had Craig Douglas, Scottish 800m champion, Ken Ballantyne, the Sward Mile winner, Gareth Bryan- Jones, Olympic steeplechaser, and Don McGregor & Fergus Murray, Olympic marathoners. Close on our heels were my protégé, Angus McKenzie [Britain’s first 7 foot high jumper, GB 7.65m LJ, 110H European Junior bronze, 7202 Decathlete, Olympic Bobsleigh; Allister Hutton, London Marathon winner, Stewart McCallum, GB 400H and Decathlon, and Allan Wells, Olympic100m Champion, so when I left in 1972 for a three-year stint as Malawi National Athletics Coach, the club was in good hands. No wonder ESH stayed up top! You can follow Sandy online: he’s passionate about a number of causes – the Art Gallery at the Botanic Gardens, Wild Life Preservation, continuation of the Mountain Weather Information Service, criticism of Russia’s role in Syria and the security of child refugees, amongst many others. On reflection, he’s always cared in general – and not just about his beloved athletics – because he’s that kind of guy. Jack Davidson at one time shared a flat with Sandy and they became good friends. A very good hammer thrower (45 metres), shot putter (3rd in the SAAA championships) and discus thrower himself, he also has warm words for his long-time friend. 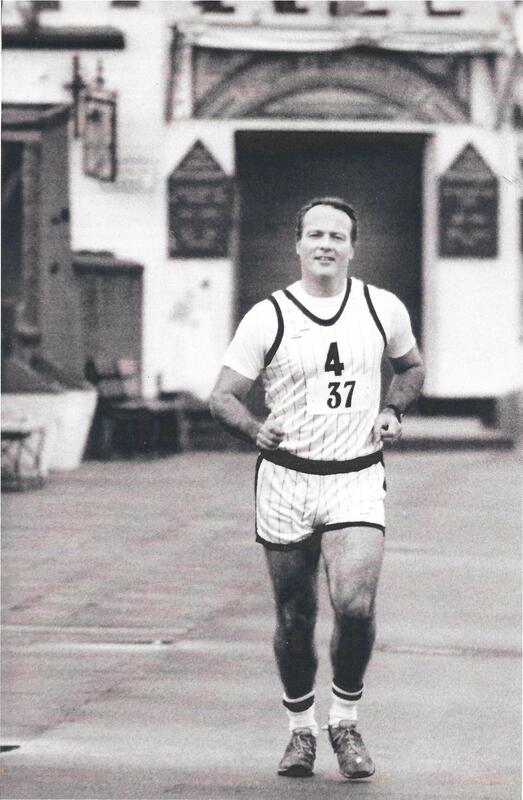 Running in the Portobello Promethon which he helped organise in the mif-eighties. 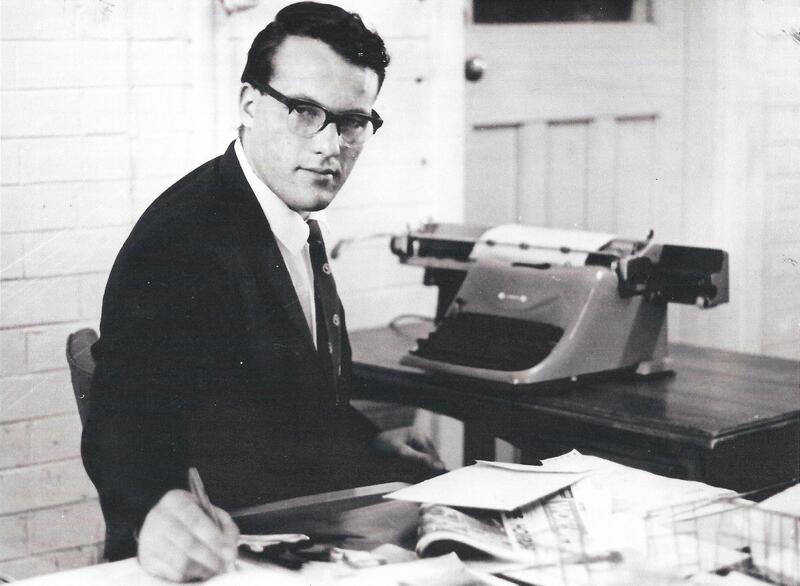 On leaving University, Sandy worked for the UAU for a year and during that time he joined Wimbledon AC and then went out to South Africa in December 1966 to work for The World Publications from March 1967 to June 1968. While he was there he travelled round competing for various clubs until he competed for the Wanderers club in Johannesburg. Why South Africa? “I had an uncle in South Africa (my mother’s brother) who had gone there in 1935 and had only once been back, and also cousins on my father’s side one of whom, Heather, I still go out to stay with in Durban. When she said “when are you coming out to see us?” I was off – travelling in an old British Caledonian Airways charter which had to avoid many of the African countries because of the boycott – we landed in Angola at an old tin shed with only whisky and coke for drinks and then on to Mozambique where I had to phone my cousin’s Mum to get her to pay an extra ticket for me as the connecting flight to Durban didn’t exist! Coming back home he worked as a sports sub-editor with Scotsman Publications from August 1968 to September 1970, a period of just over two years. This was just in time to edit the reports coming in from the journalists at the Mexico Olympics – all done at the end of a wire. 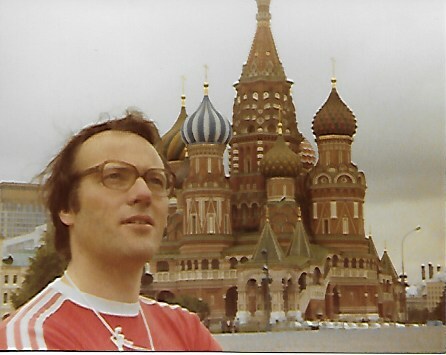 In the course of his career however he would go on to cover Olympics at Montreal in 1976, then Moscow and Los Angeles. The run was broken when he missed out on Seoul but then there was Barcelona and (after missing Atlanta) Sydney, Athens and London. Seven in all. However he has covered every single Commonwealth Games from the marvellous Edinburgh Games in 1970 right through to Glasgow in 2014: ten in all. That’s the outline, which alone is impressive enough, but when Sandy was asked how he got into journalism in the first place and what happened between September 1970 when he left Scotsman piblications and January, 2000, when he started with The Sports Basket, he gave us an amazing story. “To be honest I’m not really sure why or when I decided to take up journalism! Seemed like a good idea at the time? School magazine, an article in the GU Gilmorehill Guardian which got me in trouble with the powers-that-be? Not sure but when I decided to go travelling and head for South Africa in Dec 1966 after a penniless 18months in London I saw an advert in the Johannesburg Star for a sub-editor with The World, a tabloid owned by the Argos Group and based in Industria, an industrial estate in Joburg. It turned out to be a wonderful, privileged opportunity. Only a handful of Whites, most of the reporters, machine operators etc were African. I lived in the YMCA in central Joburg and travelled to work on the train, white carriage portion of course! Nie blankes in a different part though we did get out on the same platform and worked together under the one roof! My favourite headline from my time there was: “Fist feast forecast for Fight fans” – boxing, football and funerals were the big stories, the Morocco Swallows, the Orlando Pirates (BUCS) etc as directly attacking the apartheid government was unwise and would have got us closed down! After a while I stayed with cousins out in Krugersdorp and travelled in by train – they told me that they once had a call from the SA Police asking what I was doing there etc! Just a reminder but an unsettling one. My main memories? A trip to Lesotho with a black reporter and black cameraman and a white news editor: we crossed the border and stopped at a roadside cafe, sitting together at table – whereupon the reporter said to me: “Do you not mind sitting beside me”? If a hole had opened in the ground I think I would have crawled into it – until then I don’t think I had appreciated what the apartheid regime really did to people. I also went to Welkom gold mine in the Orange Free State to watch an African hero Humphrey Khosi run an 800 metres in front of a crowd of 40,000 – 39,950 Africans and a handful of Whites including myself. He should have gone to the 1968 Mexico Olympics and was a potential finalist if not better but SA were banned and all races suffered in a sporting context, 10.00 100 metres sprinter Paul Nash being one of the Whites excluded. To his credit Nash did not do a Zola Budd and head for Britain for whom he had some qualifications. While the “World Owed Me A Living” (yes it really did!) I started writing some columns for the Sunday Tribune in Durban, under the name of David Wightman, the chief sub-editor of the World who now lives in Durban and edits a glossy coffee table business magazine in Umslanga. He soon decided that I should write the columns under my own name and my athletics writing career had begun! Humphrey Khosi and Paul Nash were just two of the athletes I reported on! 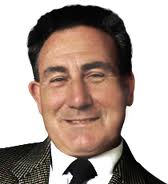 Returning to the UK in June 1968 I was interviewed for a sports desk job on the Daily Sketch which fortunately I turned down as it was to close three months later! I then travelled to Edinburgh for a job interview with The Scotsman right in the middle of the Festival! The weather was good, the city was abuzz and I had no hesitation in accepting the job offer from Sports Editor Willie Kemp. I was there just in time to start editing the copy coming in from the 1968 Olympics in Mexico City! Though long jumper Bob Beamon was the sensation of the meeting, my personal favourite was David Hemery, an athlete I came to know well and respect in years to come. Working most evenings, sometimes until 1am or even 2am, had its drawbacks and when Liz and I married in 1969, having first met at Fernieside at ESH training, it became even more trying; so when a chance came to move “downstairs” to work as a news sub with the Evening News I took it. That was good experience as the ability to write headlines and condense stories to fit available space was something I took into later life. 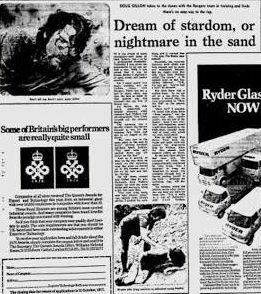 I had wanted to cover the track and field athletics for The Scotsman at the 1970 Commonwealth Games but my move off the sports desk certainly did not help that ambition. I did end up covering the badminton events and had a press ticket for the athletics including the memorable 10,000 metres victory by Lachie Stewart on the opening day (I was sitting near Chris Brasher as he bellowed: “No you mustn’t” when Lachie nipped past the great Ron Clark in the home straight to “steal” the gold medal that was supposed to go to the Australian. 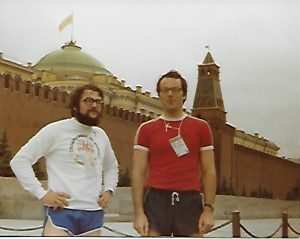 I was also in the throbbing terracing crowd on the final day of athletics to see Ian Stewart hold off Ian McCafferty in the 5000 metres final. Truly earsplitting! So I moved on, leaving the Evening News to join the Church of Scotland as a Publicity Liaison Officer, a vague title and an ill-defined job perhaps, but it did give me free weekends to develop my freelance sportswriting and soon I had regular by-lines in the Sunday Times, where the late sports editor John Lovesey greatly helped me, and Sunday Telegraph where Claude Neil (an anagram of my first two names Alec Lundie) had a free rein of subjects involving athletics and other Olympic sports! The Scotsman, Glasgow Herald (as then!) , BBC Scotland for voice reports became regular gigs for championships and international matches and I took on for six months the job of press officer for the 1973 Europa Cup Finals to be held at Meadowbank where World records were set on the very first night. By the time of the 1974 Commonwealth Games in Christchurch, NZ I had sufficient contacts and outlets to finance a freelance trip which included assisting David Coleman and Ron Pickering in the BBC commentary box. Ironically Liz instead of competing in the hurdles for which she was selected was back home expecting our first child Joanna! Montreal 1976 Olympics came and went including my first Olympic basketball final and a triumphant swimming gold for David Wilkie in the 200m breast stroke. I shared the moment with long-time friend and colleague Doug Gillon and “Chiefie”, the late Alex Cameron of Daily Record and STV fame with whom I was to share a room in LA at the 1984 Games! I shall never forget Alex burying his head in his hands as Wilkie trailed at the end of the first two lengths and sighing: “He’s blown it”, only for Doug to nudge his attention back to the pool where the intrepid Scot was powering through to victory! Round about 1978 I had another piece of good fortune as after the death of Councillor Magnus Wiilliamson I fell heir to much of the work of his sports agency. As a result Edinburgh Sports Reporting Services was formed to supply results and reports of anything that moved in a sporting fashion from athletics to tiddly winks. As well as employing as many as a dozen stringers every weekend it was to provide a useful training ground for several now well-known journos including Scottish Sports Aid CEO Roddy MacKenzie. And Liz was IC of a team of results gatherers winkling out cricket score cards from obscure pubs such as the hole in the Wall and becoming an expert in the spelling of the names of Sri Lankan cricketers! Returning to my personal career path: Barcelona 1992, Sydney 2000 where I fell out off a plane into a taxi severely jet-lagged to catch Chris Hoy winning his first cycling gold in the Team Sprint then fell asleep in his press conference, and Athens 2004 all had their magic moments. But London 2012, where my daughter Joanna was the basketball tournament director, surpassed them all. The stadium noise on Super Saturday when GB won three golds in quick succession surpassed anything I had experienced before. * there were problems with some of the athletes, notably the Daley Thomson/Colin Shields contretemps. The Public Relations Officer did not have his problems to seek. Sandy joined the National Union of Journalists when he started with The Scotsman in 1968 and is now a Life Member. He still attends meetings of the Edinburgh Freelance Branch (he was formerly secretary and chairman). He is also a member of the British Athletic Writers Association and was chairman for the period 2011 – 2013. The presentation photographs on this page were made at the prestigious annual award ceremony at the Tower of London Restaurant in December 2012. In the course of his career, he has covered seven Olympic Games and twelve Commonwealth Games. In 2014 he and Doug Gillon notched up a Triple Scotch when they covered their third Commonwealth Games in Scotland. When you add in his coverage of World and European Athletics, cross-country internationals and championships. In addition to his athletics, he has a major interest in basketball and has held senior positions on committees and with teams for many years. In addition there are all the other sports – orienteering, hockey, etc – that he writes about less frequently but with no less authority. From all these, an influenced in no small way by his own competitive experiences, there is a wealth of experience that adds colour and insight to his coverage. “We have 3 children, Joanna the eldest, captained Scotland and British Universities at basketball, went on to become the tournament director for the 2012 Olympic Tournament after working for the World governing body in Munich for 10 years. She married an American Roger Baugh who was the 2012 Village IT manager and they now have 2 daughters so that is our Olympic Legacy! Catherine our second daughter is a GP on Arran, having served on 3 overseas tours with MSF, 2 in Africa and one in Pakistan, and Malcolm our youngest is in 3rd year Medicine at Aberdeen Univ having been a Rapid Response Paramedic after completing a Modern Languages degree at Edinburgh. He captained Scotland u-16 at basketball and also represented Scots Universities. I play a lot of bad golf having recently been admitted to Kilspindie, near Gullane and Muirfield and am still a country member in Golspie where we retreat as often as possible. The bunker at Golspie which I mutilated or desecrated with a 4k shot all those years ago eventually recovered till a bad winter storm three winters ago almost wiped it out altogether! I am a notional fan of Inverness Caley due to my having been born in Inverness and a frustrated fan of Arsenal on Champions League nights! I continue to write, report and broadcast about athletics and basketball! The story of how Sandy came under the wing of Alex Dalrymple is told already in this profile but it should be noted that Alex had a squad of good athletes already. One of the best of those was Ian McPherson, four years older than Sandy, who went on to become Scottish Senior Shot Putt Champion two years in succession. Ian has given this outline of Alex and his influence on the Golspie community. “I travelled by bus every (secondary) school day the 18 miles from Lairg to Golspie – a school with about 200 pupils including primary. When I first arrived the gym teacher clearly was not interested in athletics – every gym session involved picking teams and playing football, at which I was pretty crap. Not surprisingly, at the Sutherland schools annual athletics championships we regularly got tanked by Dornoch, the only other secondary school in the county. Approximately 3 years later we got a new PE man, a tough cookie called Alex Dalrymple, who soon upbraided us for this annual disgrace/embarrassment/humbling, and then set to with proper PE sessions and lots of training in all branches of athletics, including, of course, events we had never even seen, e.g. shot putt, discus, pole vault, hurdles etc and even involving staying behind and training after school hours! Mr Dalrymple’s approach soon showed dividends – after a couple of years we started tanking Dornoch, winning events at the North of Scotland Schools Athletics Championships in Inverness (where the opposition was quite stiff, since it included the Inverness schools, Gordonstoun etc). The first really big success was a gold medal in the 12 lb shot putt at the Scottish Schools Championship won by one Forbes Munro – a naturally talented and muscular athlete. Forbes later won the 16 lb event at the Scottish University Championships but did not maintain his interest. Maybe 2 years later I became obsessed with the shot and discus, taking the implements home and making considerable progress over the summer hols. After a memorable Dalrymple car-trip to the Scottish Schools Championship at George Heriots School in Edinburgh, I was well below my best but managed to win the shot and discus, even beating the massively muscled R Ross from Boroughmuir, the previous years shot winner. The exact dates are a bit vague for me now, but I think that Sandy won the shot and discus at all three age groups over the next few years, then proceeded to come second in the shot at the AAA junior champs, but also featuring in the Scottish Seniors. I believe Alex D saw an opportunity and successfully exploited an underdeveloped area, working out how to do it all by himself. He later left teaching and became, surprisingly, the Warden at Glenmore Lodge, the outdoor centre near Aviemore, where he later became ill and passed away. A trophy in his name is presented to the outstanding athlete at the Scottish Schools event every year. “On further reflection, I guess Alex D had quite an effect on the lives of me and Sandy, transforming me from a bit of a swot (as I was called!) who sat about on the radiators while all else played football in the breaks, into the top Scottish shot putter over a period of some years. Likewise, I presume Sandy would not have become a sports reporter without his athletics background. 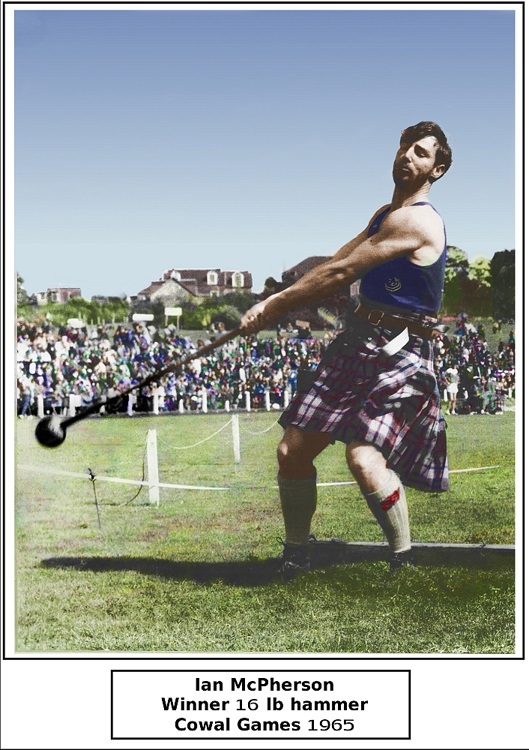 “I came across Dougie in the early 70’s, probably at one of the Scottish Championships. We related to each other pretty well and, unlike other athletics journalists, I felt I could trust him and indeed this proved to be the case throughout both my athletics and work career. We met each other often at major events and sports dinners and also during the winter road and country seasons. When I began working at Babcock and Wilcox in 1974 Dougie would join myself and my training partner Norrie Scott for lunchtime runs around Barshaw Park in Renfrew. Dougie was working for the Sunday Post at that time and would arrive at our training ground (Moorcroft Park) in his company’s pool car which was a black Morris Minor. He and his wife Mary attended our wedding in 1975 and when I joined Glasgow City Council in 1978 Dougie and I would communicate regularly on a professional basis. 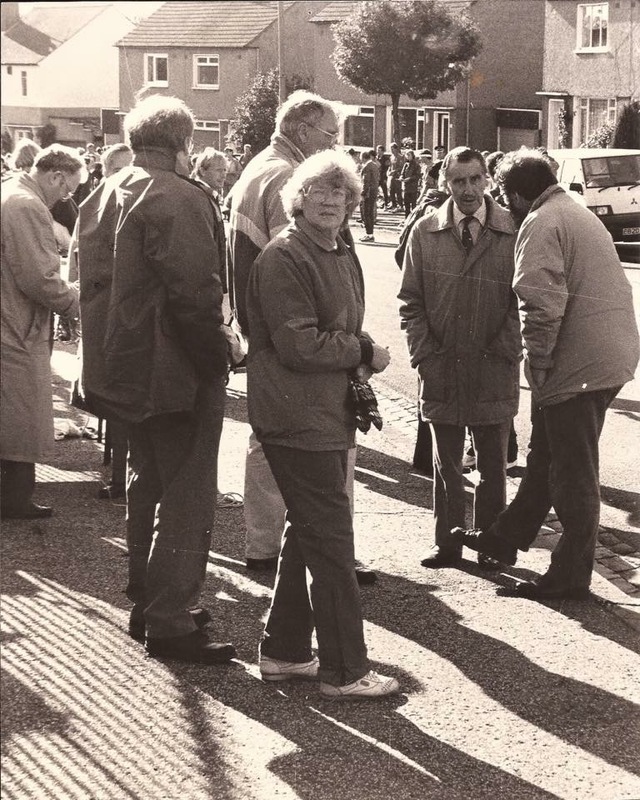 Part of my job was to secure major events and Dougie was always supportive in encouraging this with forewards to bid documents, articles in programmes and of course newspaper articles. He was an active member of the Glasgow Sports Promotion Council (provides funding for major sports events in the city) and also served on the Selection Panel for the annual Sportsperson of the year Awards ceremony. I recall one particular story that we hatched up concerning the Scottish Vets Cross Country Championships that my club Linlithgow Athletics Club were organising in the 1991. The route took us past a medium sized but disused workshop at the bottom of Linlithgow Golf course and after some discussion with Dougie we agreed to open both doors of the building and take the race right through the workshop and past the lathes and turning machines. This step was duly rewarded with a headline in the Herald ‘ Linlithgow AC stage first ever indoor cross country championships’. Doug Gillon was a stable fixture all through my up and down athletics career. I saw him at most races and became friendly with him over the years. I would always get a Herald on a Monday to read Doug’s articles. He really championed athletics in a city where sport is dominated by football. He achieved so many column inches because his coverage was erudite, entertaining and passionate so that even people not interested in athletics would appreciate the articles. Doug was very interested in telling the athletes’ stories, not just reporting their performances and took the trouble to get to know people. You could tell him things were ‘off the record’ and be confident that he would not write about them. This meant that people were confident about speaking to him. He wrote a very nice and positive article about me in the mid 1990s which I appreciated a lot at the time. Doug really wanted Scottish athletes to do well. I remember that he took the trouble to come to speak to me before an Olympic Trials final. This was not part of his work, but he wanted to encourage me. I don’t think I had any chance of making the team but I felt that he really believed that I could. I think that this shows that Doug was much more than a journalist to many of the athletes that he wrote about. Doug also liked to have a drink after events! One evening after the indoor championships at Cosford I found myself on a station platform with Doug, Mary Anderson and Andrew Currie (father of Alan and Alistair) Currie with the prospect of a 5 hour train journey on a Saturday night back to Glasgow. Doug set off to find an off licence and I thought that he was about to miss the train. He arrived back at the last minute, but empty handed. However, there was a bar on the train and we passed the journey with rounds of whisky miniatures. I’d had a rubbish run at Cosford but left the train feeling very merry! 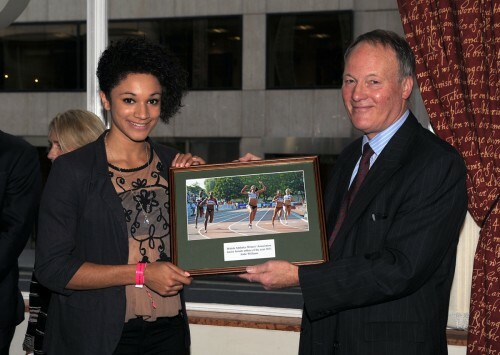 It was a great loss to athletics in Scotland when Doug retired, but I hope he is enjoying it! 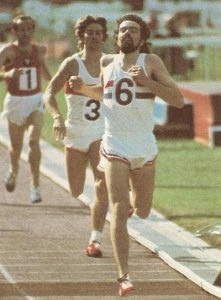 “Doug Gillon was part of the fabric of Scottish athletics, particularly distance running and cross country, for virtually the whole of my time competing. He travelled the length and breadth of the country attending local as well as national events. I remember coming across him when out for a run through Johnstone one rainy September Saturday in the early nineties. He was on his way to cover the Kilbarchan road relays and had got his dates mixed up and was a week early. Of course he still returned the next week to cover this local race. We were spoilt in those days getting such extensive press coverage and that was solely down to Doug’s determination to give our sport such a positive national profile. Doug enjoyed interacting with athletes and always took an interest in their life stories and reflected these colourfully in his articles. He developed friendships with athletes and officials and I fondly remember many times enjoying a pint with Doug in the company of his Victoria Park club mate and internationalist Alastair Douglas. In student circles he was known affectionally as “Dougie Greenwelly” as proclaimed by the the unofficial magazine of the time “the Nippler”. Doug was a staunch supporter of Scottish athletes and would accompany teams to many international events including the world cross country. I once was sent the wrong way at the end of the Gateshead International cross country, dropping from 2nd to 4th. As I went to confront the officials I noticed Doug had beaten me to it and was already urging the race referee to reverse the result – which he eventually did. “THEY crested the final hill together, like the four horsemen of the Apocalypse, wind and rain lashing horizontally at their backs, each intent on the destruction of the others. 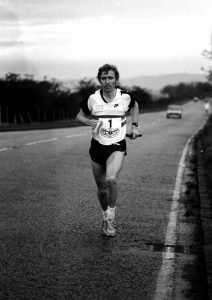 Colin Youngson is probably the most successful Scottish road runner of them all in terms of medals won – ten in the Scottish marathon, thirty Edinburgh – Glasgow relays, and all the classic races such as the Mc Andrews, the Nigel Barge, Edinburgh to North Berwick, the Two Bridges, etc. He is now a successful veteran runner has long been an admirer of Doug’s work as well as a friend. “As I gradually became a decent road relay and marathon runner, Doug Gillon often turned up at major Scottish races, cheering enthusiastically and then quickly interviewing successful participants. We all looked forward to his reports in The Glasgow Herald (which became The Herald) on Mondays. Such precise, insightful, celebratory journalism, laced with characteristic wit and encouragement. He tackled controversial topics resolutely and was particularly unforgiving towards drug-taking athletes. Doug Gillon contributed hugely to the sport for so many decades and remains a very well-liked and respected man. Two quotations from his writing are lodged clearly in my memory. 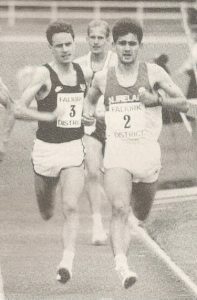 One is from June 1981, when I had to work extremely hard to win my second Scottish Marathon title (which finished at Meadowbank, Edinburgh) not far in front of 1972 Olympian and reigning World Veteran Marathon champion Donald Macgregor and the talented Alastair Macfarlane, a Scottish International runner. By the time that the medal presentation took place, most spectators at the Scottish Track Championships had gone home. Doug reported wryly in the Sunday Standard, describing the three medallists as “ageing but speedy war-horses, mounting the rostrum”. (I was only 33, Donald 41 and Alastair 35). Fair comment, though! Well known and highly respected athletics historian Bob Phillips, long time friend of Doug’s, writes. Doug, as well as being one of the most interesting writers about sport in the English language, is also one of the friendliest and most generous of companions (although his driving is a bit frightening!). Anything that Doug writes will get you thinking about the role of sport in all of our lives, participants or not, and, unless you are lucky enough to be as knowledgeable as he is, is guaranteed to provide you with new information or facts that you had never come across before. Anything he writes will have been very well researched and is of interest not just to those with a passion for sport. I know he has been a great support for many Scottish athletes and not only when they are in their prime but long afterwards, offering advice and practical help. He has been a great champion of Scottish sport and in particular, of Scottish athletics,over more than half a century. 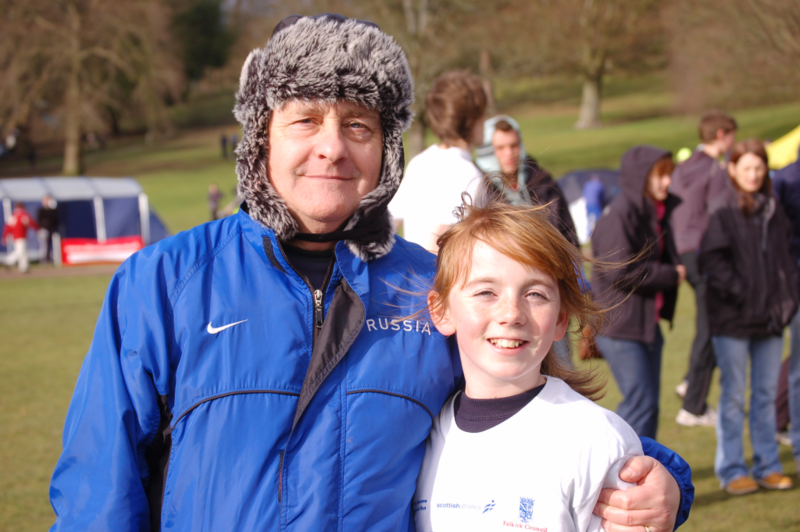 Ross Hepburn first met Doug when he (Ross) was a world age group record holder for the high jump. 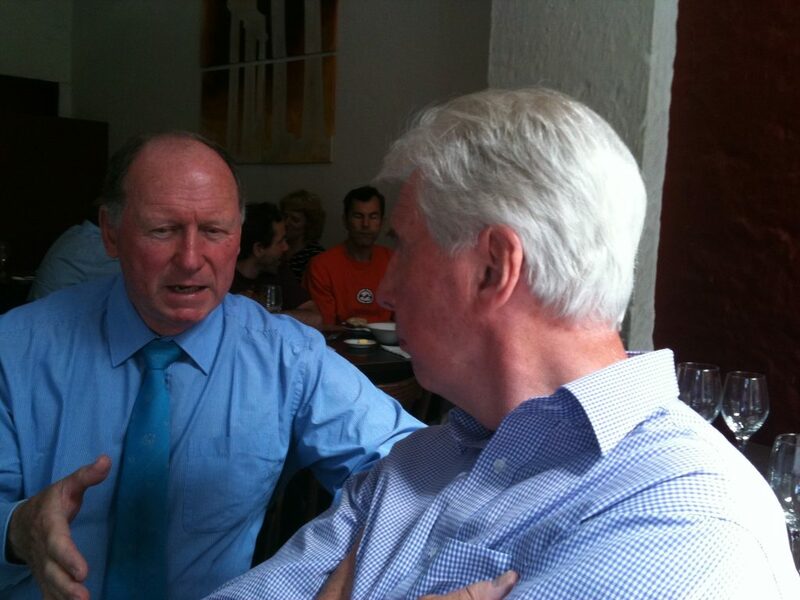 They are still great friends and Ross was keen to have his say. “My first memory of Doug dates from when he interviewed me at the Guinness School of Sport at Dunfermline College in 76/77. It wasn’t until the late eighties until we met up again, by then I had lived in Germany since 79. Now a young man, sort of foreign to his native country, whenever I came home for a holiday it was Doug who helped me along unselfishly. Whenever I needed some sort of assistance, he was always there to help and point this or that out. Even on the phone from Germany before “deadlines” if I had a question or something on my mind he would always help to sort it out! I still have good memories as a younger lad getting the chance to visit the Herald sports desk, and getting tucked into bacon rolls at the paper’s local greasy spoon. Also the great stays at his house in Glasgow and Cornwall along with good conversations with him and his wife Mary still go through my head from time to time. Equally I thoroughly enjoyed meeting up with him and his journalist mates during, amongst others, the World Championships in Stuttgart and Berlin. The one competition which topped the lot though was the European in Budapest in 98. Due to a ruptured achilles tendon caused by a last try at high-jumping about 4 weeks earlier, I travelled by train with a stookie on from Stuttgart to Budapest changing in Munich and Vienna. It was in Munich that I lost my rucksack with the anti-thrombosis injections inside, this was a bit worrying. Once off the train in Hungary I contacted Doug, told him the story and without delay he phoned the British Team doctor who quickly arranged a meeting point. Once it was clear what I needed we all got in a taxi to the next chemist and the necessary medication was purchased. 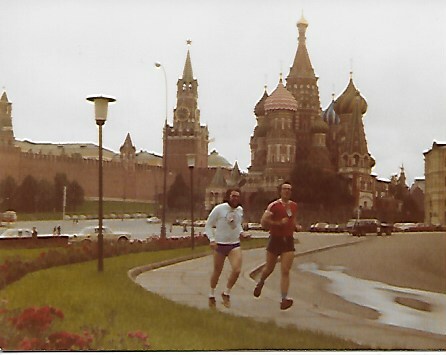 There we were, standing on the street with the medication, when the doctor disappears quickly into a taxi back to the athletes hotel. I said to Doug that I was going to ask him to give me an injection because I couldn’t do it myself. “WHAT!” He says, “come on let’s get back to the press centre and let me have a think about this.” Back at the centre I tell him that in Germany the old lady next door has been giving me the injections. “OK, lets go in the gents and I’ll do it”. We are by this time both in hysterics. We get into a cubicle, I lift up my t-shirt and say “Stick it into my belly!” Then someone at the same time flushes in a neighboring cubicle. Words cannot describe the horror we both felt at maybe being caught together in the gents in a cubicle – in went the needle, exercise over! And we didn’t get caught. Oh, and another thing (sorry about the plagiarism), I have to thank Doug for more than that injection and look forward to meeting up with him again sometime soon! Always professional but not afraid of tackling the bigger issues within the sport. He is a respected figure withing the coaching fraternity and his knowledge of athletics is encyclopedic. The athletes both like and respect him. He probes and often surrounds his reporting with personal touches. He knows the sport inside out and is a strong advocate for Scottish athletes and Scottish Athletics and it is evident that he is always intensely proud when a Scot comes good. Doug interviewing Andy Forbes at the start of the McAndrew Relay. Surrounded by officials and former athletes Molly Wilmoth, Willie Laing and Brian Goodwin. 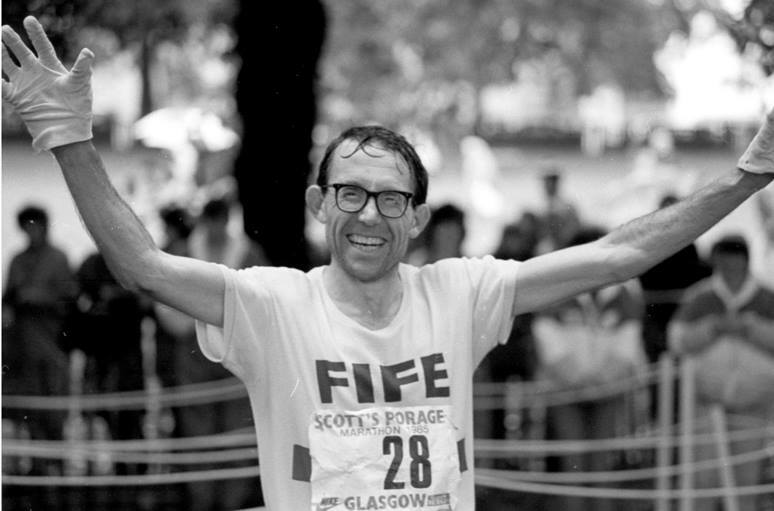 But however good he was as a runner, Doug is best known and respected throughout the sports community in Scotland as a top class journalist and reporter. He went to 12 successive Commonwealth Games, reported every Olympics from 1972 to 2012, and every World Athletics Championships from their inauguration in 1983 to 2009. Plus world championships in curling, world title fights in boxing, indeed, some 60 sports in nearly 50 countries. That’s all true but there is more to a 34 year career with many awards and accolades than luck. I could name several sports journalists who had all the luck and connections that could be wanted and who failed to stay the course, or even leave the starting blocks convincingly. When I came into the sport in 1957, George Dallas was writing the reports for the ‘Glasgow Herald’: he recorded the events and people in the sport faithfully every week. There were a couple of years when athletics was reported by ‘Our Athletics Correspondent’, before Ron Marshall who was correspondent for a time. Doug occupied the post for much, much longer than any of them. There are several pitfalls that can shorten a sports journalists career, and among those that Doug avoided are the following. First, one famous TV reporter coming to Glasgow for the first Gaymer’s 10K road race asked a runner, “How far is 10K in miles anyway?” Not Doug. He always did his homework. And for much more difficult aspects of the sort than that. Second, there was the reporter who said that all cross-country races are the same, with the same team winning every week. A remark like that shows a disconnect from the sport and a lack of understanding of what it is about. He watched the races without seeing them. Third, there was the chap who wrote at length that the 1500m distance would never be taken to by British athletes or spectators. They would be much more at home with an uncomplicated four laps, and perhaps the 1600m would be better suited to us. So Doug’s long career as a journalist was just “happy serendipity”? I don’t think so. 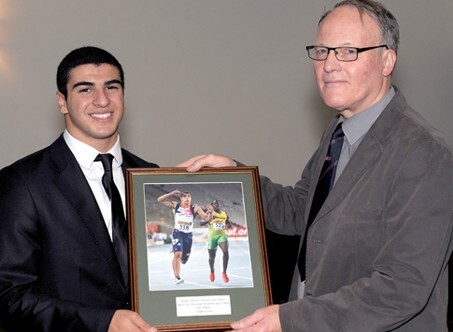 Let’s look at how his interest in athletics developed and how the runner became a journalist. When asked Doug is quite straightforward . Colin has already quoted Doug on his family background and the sporting inspiration that that provided. Doug went as a student to Heriot-Watt University and while there was editor of Omega, the student newspaper. He says hadn’t a clue what he was doing, “but it confirmed that my initial dreams about journalism had been correct. I applied for a sports writing job but it was downhill in journalism from there! Deputy sports editor was the closest I got to becoming an editor again (at Sunday Post, and then Sunday Standard) before switching to writing full time. I enjoyed the creativity of page design and story and picture-evaluation, but I’d have hated the administration and bureaucracy of being sports ed, which is why I pursued reporting and covering events, having turned down an offer from Andrew Jaspan to become sports ed at Scotland on Sunday. “I went for several interviews at the Sunday Post (some 80+ applicants). I’m convinced there was nothing to separate those on the short list, until I was asked what I knew about sports other than football. I guess I had a fair breath of knowledge and was able to answer some specific searching questions about Eric Liddell. That may have been what got me the job, for later I learned my interviewer was a huge Liddell fan, and had helped write a short book on him. “This interviewer warned me that research is crucially important: for every reader, the newspaper reporter is “The Expert.” That’s a really scarey thought. An enormous responsibility if taken seriously. And a much more challenging ask in the era before the internet. Journalists today are overly-reliant on Wikipedia, over which there is no quality control or guarantee of factual accuracy. 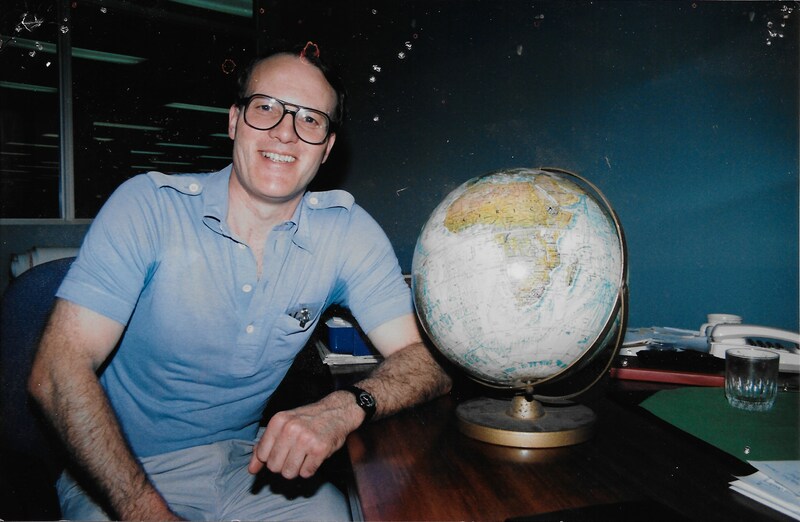 “Another bit of early advice came in the nature of sports writing as expounded by my first sports editor, an outstanding mentor called Johnny Rankine. Like John Anderson, he had been brought up in the Gorbals. He was giving another young reporter a bit of a bollocking for something, and I recall rather timidly remonstrating with him: “but Mr Rankine, he’s an awfully nice lad. I don’t bloody want awfully nice lads, Dougie. I want cheeky young buggers that do their research and can write a bit.” And very pointedly he nodded at the book of football scores and statistics which it was my job to keep up to date after every Scottish League match. When Doug started with the Sunday Post in 1968, the new phenomenon is Scottish sport was the first custom built sports centre in the country at Bellahouston and the ever alert Doug realised this would catch on. He persuaded the sports editor that the paper should reflect this changing culture. He agreed, and Doug’s transition from football reporter to multi-sports writer was under way. Domestically Doug was at as many athletics events, winter and summer, as most athletes. Over the winter at the McAndrew relay, in the mud at Clydebank, on the road at Bishopbriggs, at the East Kilbride road race, as well as at championships all over the land. He would be seen talking to runners – and not only the winners – on the day during the race and be on the phone the night before the event too. 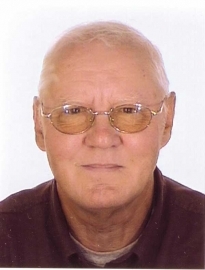 He attended track and field events and was on first name terms with all the top athletes – and many of the also-rans as well. His international portfolio also grew. 2010: Commonwealth Games, Delhi; European Championships, Barcelona. 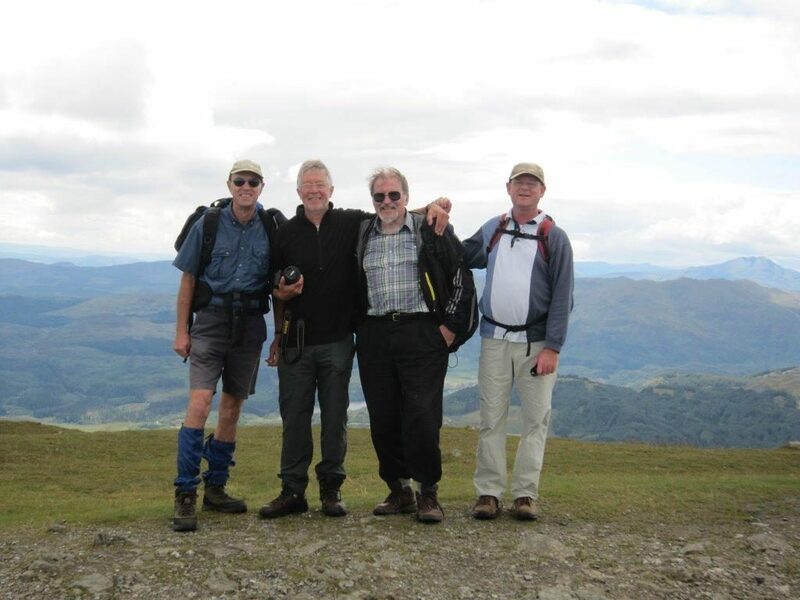 … and even after he retired the ‘Herald’ editorial team persuaded him to come back to cover the 2012 Olympics in London and 2014 Commonwealth Games in Glasgow! But that was only the track coverage (and with Doug we should probably add … ‘so far!’) Over the country he was equally active having covered the World Cross Championships in 1978, 80, 83, 87, 91, 92, 93, 95, 97, 98, 99, 00, 01, 02, 03, 05, 067 and 08 and the europeqan cross country championships in 1994, 95, 96, 97, 98, 03, 08, 09. Not content with that there were many European Cup and team championships and finals. 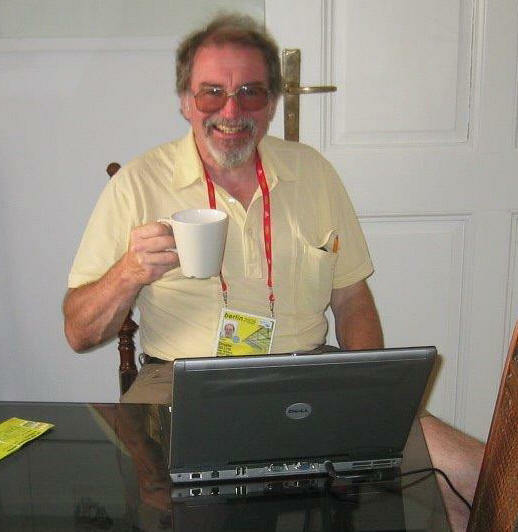 If the coverage of these events looks like a doddle, then read here for Doug’s account of covering the various Games and Championships in his own words. It is a bit of an eye opener. No editor would underwrite the expenses to these of a journalist who did not deliver the goods. Doug earned every penny. It wasn’t just the locals in Scotland who appreciated Doug’s work, he was well respected throughout the United Kingdom and even further afield. He was a working member of the Sports Journalists Association who held an annual award ceremony every year in London. Awards are given to print journalists in several categories as well as to radio and TV journalists. Among the recipients are such as Claire Balding, John Inverdale, Mike Atherton, and the awards are greatly prized. 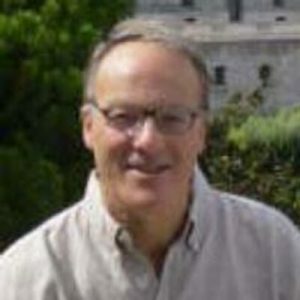 Doug has won several awards and in 2002 he won the double of Specialist Correspondent award and Regional Sportswriter award. In that year he also won the Scottish Disability Sports Special Award. A selection of his awards/trophies is below but it should be noted that there have also been a number of domestic awards which are also quite special. The SDS award in 2002 has already been noted but in 2006 he was awarded the City of Glasgow Special Award – the first time that it had been given to a Sports journalist and, in 2012 was recognised by Victoria Park and given Life Membership. 2006: (1) SJA Specialist Writer of the Year, and (2) Regional sportswriter of the year (first person outside Fleet Street to win the former): (3) City of Glasgow Lord Provost’s Special Award – only time that a sports journalist was so recognised. (4) Scottish Curling journalist of the year (for discovering four Scots had won Olympic gold in 1924, and not just demonstration medals). Doug also won his weight in whisky as best Scottish correspondent of the 1986 Commonwealth Games (15st 05lbs, after going on a fattening diet). This equated to 85 bottles. And as the sports editor of the winning journalist also won his weight in whisky, our man also won a few Brownie points! Away from the awards scene but not a bit less noteworthy, Doug was the first Scot to be secretary, and then chair, of the British Athletics Writers’ Association, (Sandy Sutherland has now also been chairman) and served on the Sports Council for Glasgow for many years. When he announced his retirement from the sport in July 2010, the Sports Journalists Association commented on 9th July, 2010, that he would step down after the Scottish championships later that month and try to wean himself off his “addiction” to his work. He had been a fixture in sports press boxes since 1968, first covering the Commonwealth Games in 1970. He had covered every summer Olympics since 1972 where he was able to report on his friend and former training partner Frank Clement racing in the final of the 1500 metres. 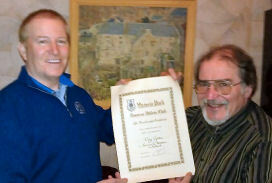 The article continues, “Fittingly therefore, when Clement was honoured at Glasgow City Chambers recently for organising major athletics events in the city, Gillon’s life work as a journalist was also recognised by Lord Provost Bob Winter with a special award citing his coverage of Olympic and disability sport. Donald Cowey, the Herald’s sports editor said, “Doug is justifiably one of the most respected sports journalists in Britain, and has been a credit to the Herald for over 30 years. 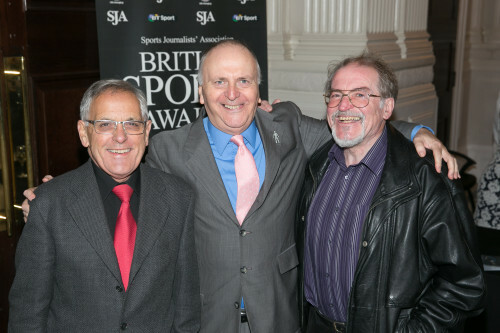 In an award studded career which has included three SJA British Sports Journalism gongs, Gillon last year received a life time achievement prize at the Scottish Press Awards. On Wednesday night with UK Athletics staging its Super8 event in Glasgow, Ed Warner, UKA’s chairman, made a special on the infield at Scotstoun saying”You have done outstanding coverage of our sport for a very long time. I know that people who read your work appreciate it.” and Liz McColgan said – “A great loss to our sport as Dougie was an avid supporter. Doug was always so enthusiastic about performances, especially by a Scot. He would run every step of a race with you and then share the elation of a win. He is a great guy and a friend.” At the same time Steven Downes, secretary of the SJA, after saying that Doug always went out of his way to be helpful to colleagues, was incredibly diligent in everything he researched, wrote with passion and great insight, always worked bloody hard – and was great fun, went on to tell a wee story that typified Doug’s attitude. He said: “It was 1996, and after the Atlanta Olympics, two plane-loads of athletes and journos were flown out to Sarajevo for the first ‘normal’ sports event to be staged there after the civil war. In many respects it was absolutely terrifying – our rooms in the Holiday Inn on snipers alley still had huge shell holes in the walls, while the Kenyan distance runners had to be quietly warned not to run on the grass verges in case of land mines. …. Michael Johnson, probably the biggest star in track and field at that time opted not to go on the trip because his mother told him it was too dangerous. Flying in and out was a bit shaky and had to be done in daylight because there was no radar at the airport. But the airport was the only place where any of us could get a signal to send our copy. So after the meet we were all bussed in a rush to the airport where we immediately got on to copy and then hoped we could get out of Sarajevo before dark. A gaggle of journalists , Doug, Neil Wilson, Tom Knight, Ian Chadband, all queued up together for the flight. Primo Nebiolo, the head of world athletics, was there with his wife, Seb Coe was there, Charles Austin who still had his new Olympic high jump gold in his hand luggage and Jon Mayock. Further to the Frank Clement remarks, Doug had covered every summer Olympics since 1972 and four years later took pleasure in reporting on his friend and former training partner, Frank Clement’s fifth place in the 1500m final, where he insists Clement would have medalled had he not been barged off the track on the final lap. It was a memorable race in more ways than one – on a wet day, Frank warmed up in the only unsheltered part of the arena, not the fastest on paper he planned, if he were with the leaders at 300m to go, he would make his move then. If you watch the video, you will see that just at that point he was shoved off the track and on to the grass. Watching it again, we have to agree with Doug’s opinion. Again. 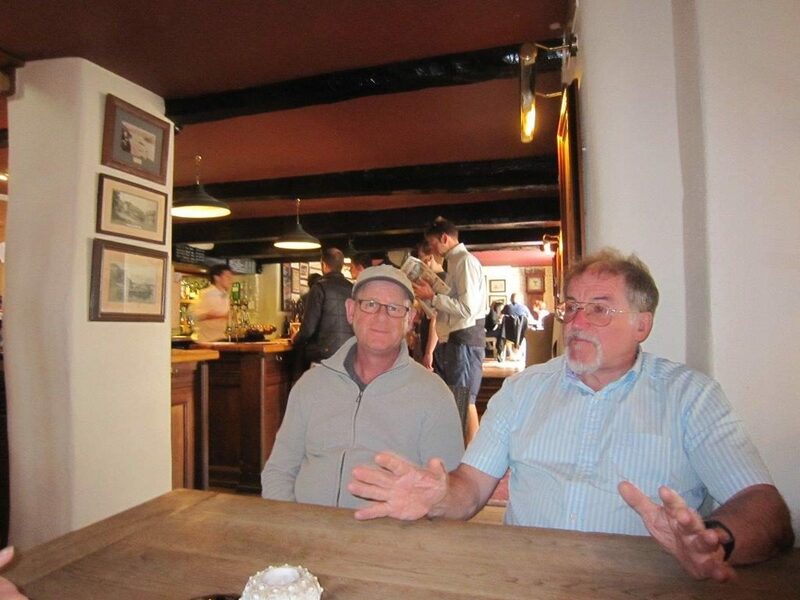 For the where are they now column, Doug replies when asked: “I now live in a Cornish fishing village, sing in a male voice choir and a folk and sea shanty group for which I write song lyrics, and with whom I drink Real Ale. We raise thousands for charity. The knees have gone, and now that I live on the shore of Plymouth Sound, amid stunning scenery for cliff top runs, I can’t raise a trot. He then finishes with the comment, “I believe the mind, not technological or physical advances, drives sporting improvement.